If you are looking for new doors in Vancouver, WA, there are several aspects you should consider when making your selection to ensure you are getting the absolute best deal, not only in the moment but in the long run as well. Doors are an important aspect of your home which can say a great deal about you and the rest of your household, so making the right decision is imperative. 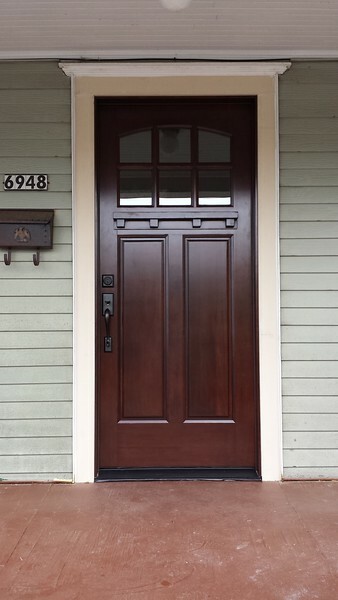 This is, of course, one of the first facets of entrance doors and storm doors in Vancouver, WA. While efficiency is certainly important, you should always make sure that your doors match your home as closely as possible. This is crucial to keeping you satisfied with your selection and purchase for as long as possible and giving your house its best possible appearance in the years to come. A stylish front door is surprisingly important when it comes to making a good impression on visiting friends and family, and therefore merits a good deal of consideration. Your homes overall efficiency should always be a concern. Not only does this have strong implications for the surrounding environment, but for your budget as well. Different door styles have varying degrees of efficiency. For example, doors with glass panes are by and large less efficient than other models, and wooden doors tend to be heavier and therefore provide better insulation, but require a bit more maintenance than vinyl options. Speaking to a professional about all available options help to ensure you are making the best possible decision during this process. In the end, there are many, many options available to those shopping for doors in Vancouver, WA, each with a plethora of pros and cons which should be considered before a final decision is made. Regardless of your personal style, rest assured that you will find your ideal match when consulting with a professional with a door company of your choice.